New Castle disease (new) | Infonet Biovision Home. Newcastle disease is a devastating malady in unvaccinated chickens of any age. This often results in high mortality (up to 95%) specifically in young birds all over the village and in the worst case when infected birds are brought to the market to all the surrounding area. 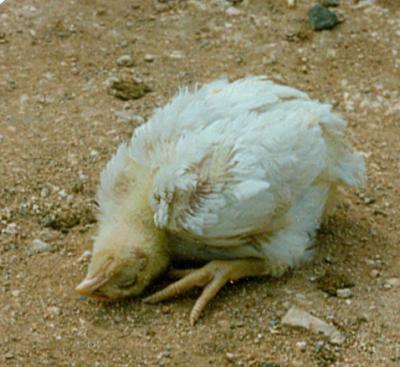 Newcastle disease is a devastating malady in unvaccinated chickens of any age. This paramyxo virus is infecting most birds by contact or faeces. The severity of symptoms may vary greatly in different species but dependents as well on the virus strain. So infection can be spread by migrating wild birds and affect unprotected chicken. In Kenya mortality rates are usually high in January (80-100%) in non-vaccinated flocks (Njue, et al., 2001). Outbreaks are usually associated with the introduction of local chickens from elsewhere especially during Christmas festivities (Kasiiti, 2000) when they are sold in open-air markets. The owners of the local chicken are aware of the clinical signs of the disease and as soon as some birds start to die of the disease, the rest are sold off or given out as gifts. Most of them would be in the incubation period, which is a further reason to spread the disease. Transmission is by direct contact with secretions, especially faeces, from infected birds or by contaminated feed, water, implements, premises, human clothing, etc. There is no treatment for the disease once it occurs. Diseased birds have to be killed in a humane way and disposed off properly. Some other infections (e.g. Mycoplasma) may aggravate the vaccine reaction. Killed virus vaccine should then be used. Kasiiti, J.L. (2000): Isolation of Avian paramyxoviruses from village chickens and wild bids in Kenya, Msc thesis, University of Nairobi. S.W. Njue, J.L.Kasiiti, J.M.Macharia, S.G.Gacheru and H.C.W.Mbugua: Evaluating the Effect of Newcastle Disease Control and Improved Feeding on Productivity of Village Chickens in Kenya.